The first hurdle I had to get over with this film was some of the mediocre promotion. 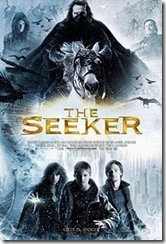 This movie gave the appearance to have been overly influenced by the Harry Potter films which caused me to initially think it was some kind of bad Potter knock off. Honestly, I expected to see a scene about 15 minutes into the film for someone to turn to Will and tell him that he is a wizard. Thus why I initially didn't care about it, I don't need a Potter knock off I can just watch or read Harry Potter. I'm glad that I was able to move past that obstacle because this film is not a Potter knock off. That being said the cinematography has a lot of Potter cinematography influences in it and it pulls a lot of it's flavor from classic fantasy elements but that is where the similarities stop. Overall this movie was an enjoyable experience. Fans of fantasy they will enjoy this film because it hits all of the fantasy notes but it will not be a knock out because it does not move beyond your typical fantasy story elements. Those who are not fans of fantasy will probably find the fantasy elements to be overly cliche. As for me I'm a fan of fantasy and found it to be cliche but still enjoyed the fantasy tale. The Plot: Will Stanton is a day away from his fourteenth birthday when he finds out that he is the Seeker a special warrior of light. Aided by a small group of timeless warriors of light known as The Old Ones and the special powers that just awoke within him, Will travels through time to gather the six Signs. The Rider who is The Dark that will rise and cover all of the earth in five days leaving Will only a short amount to gather the Signs which gives him enough power to defeat The Dark. The movie is based on the second book in a series of children's novels by Susan Cooper which were published in the 1960's and 1970's. The lack of plot twists I figured out how it would end within the first 10 min of the movie and I'm usually not that good at the game of guessing the ending nor do I try to but this was so obvious I could not help it. The characters were very flat and lacked depth, that being said they were still interesting.